For sixteen years now the Low Racer is the fastest production bike in the world! 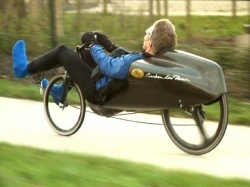 De bike that delivered M5 many world records is probably the most copied bike at the moment. It's unmatched speed and comfort make the M5 Low Racer a must have for any (long distance) commuter or racer. Together with the many accessories like the Tail Fairing, carbon monoblade front fork or even a carbon handle bar the M5 Low Racer can be tuned to the ultimate racing machine, bringing victory within a hand's reach. The Carbon Tail Fairing offers a spectaculair gain in power of 30 percent! 10 percent faster with the same effort! The M5 Tail Bag: ideal combination of energy efficiency and luggage capacity. Volume: 88 ltr. Energy consumption just 175 Watt at 40 km/h ! Standard hydrid bike with luggage at same speed around 850 Watt! It's the only way to keep up, even if you're a greyhound!